The AFL-CIO held its convention the week of September 14, 2009, in a time of uncertainty. 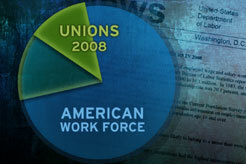 A new Gallup poll showed support for unions at the lowest level since they began posing the question in 1936. And, although there was an up tick in membership in 2008, the percentage of American workers represented by a union is down to about 12 percent from more than 25 percent in 1950. But, there is also a new AFL-CIO leader, a new president in the White House and a Secretary of Labor who support some of organized labor's priorities like the Employee Free Choice Act. Bill Moyers talked with experts Bill Fletcher, co-author of SOLIDARITY DIVIDED: THE CRISIS IN ORGANIZED LABOR AND A NEW PATH TOWARD SOCIAL JUSTICE and Michael Zweig, director of the Center for the Study of Working Class Life at SUNY Stony Brook, about the state of organized labor and what it needs to do face the challenges of the 21st-century economy. As World War II came to an end, more than a quarter of the American workforce belonged to unions. Labor leaders wielded major clout in Democratic Party politics. They had the ear of the White House and Congress. That power plummeted as states adopted right-to-work laws, jobs moved overseas, and union-busting campaigns by corporate America became commonplace. For many, the benefits of union membership � job and wage security, workplace safety, health and pension benefits � evaporated. >Learn more about and contemporary issues facing America's workers and about American labor history. >What do you think unions can offer America today? Tell us on the Blog. Michael Zweig is professor of economics and Director of the Center for Study of Working Class Life at the State University of New York at Stony Brook, where he has received the SUNY Chancellor's Award for Excellence in Teaching. His most recent books are WHAT'S CLASS GOT TO DO WITH IT? : AMERICAN SOCIETY IN THE TWENTY-FIRST CENTURY (2004) and THE WORKING CLASS MAJORITY: AMERICA'S BEST KEPT SECRET (2000). He was executive producer and co-writer of the documentary MEETING FACE TO FACE: THE IRAQ-U.S.LABOR SOLIDARITY TOUR (Center for Study of Working Class Life, 2006). Zweig has a long history of social activism combined with scholarly work and has published widely in professional and general circulation journals, including THE AMERICAN ECONOMIC REVIEW, THE AMERICAN ECONOMIST, THE REVIEW OF BLACK POLITICAL ECONOMY, THE REVIEW OF RADICAL POLITICAL ECONOMICS, and TIKKUN. His earlier books include RELIGION AND ECONOMIC JUSTICE and THE IDEA OF A WORLD UNIVERSITY. Professor Zweig is active in his union, United University Professions (Local 2190, American Federation of Teachers, AFL-CIO), representing 29,000 faculty and professional staff throughout SUNY; has served two terms on its state executive board; and represents UUP on the national steering committee of U.S. Labor Against the War. He lives with his wife in New York City and on the North Fork of eastern Long Island, where he has been named "Citizen of the Year" by THE SUFFOLK TIMES for his writing and community organizing around issues of planning, zoning, and land use. Bill Fletcher, Jr., is the executive editor of THE BLACK COMMENTATOR and founder of the Center for Labor Renewal. A longtime labor, racial justice and international activist, he is the immediate past president of TransAfrica Forum, a national non-profit organization organizing, educating and advocating for policies in favor of the peoples of Africa, the Caribbean and Latin America. Fletcher is also a founder of the Black Radical Congress and is a Senior Scholar for the Institute for Policy Studies in Washington, DC. Fletcher is the co-author (with Fernando Gapasin) of SOLIDARITY DIVIDED: THE CRISIS IN ORGANIZED LABOR AND A NEW PATH TOWARD SOCIAL JUSTICE. He was formerly the vice president for International Trade Union Development Programs for the George Meany Center of the AFL-CIO. Prior the George Meany Center, Fletcher served as Education Director and later Assistant to the President of the AFL-CIO. Fletcher got his start in the labor movement as a rank and file member of the Industrial Union of Marine and Shipbuilding Workers of America. Combining labor and community work, he was also involved in ongoing efforts to desegregate the Boston building trades. He later served in leadership and staff positions in District 65-United Auto Workers, National Postal Mail Handlers Union and Service Employees International Union (SEIU). Published September 18, 2009. View a collection of JOURNAL reports on the effect of the downturn on the homefront. View our complete coverage of the banking and bailout crisis. Official Web site for documentary produced and co-written by Prof. Zweig. "The War and the Working Class"
by Michael Zweig, THE NATION, March 13, 2008. Watch Bill Moyers interview with Prof. Zweig from 2004. Explore some of the numbers about workers and unions in the United States. Read a selection of Bill Fletcher's speeches and articles. Digging deep into the roots and evolution of the American conservative movement, Sam Tanenhaus talks with Bill Moyers about why he believes that conservatism is dead and how it might yet come back to life. Tanenhaus is the editor of both THE NEW YORK TIMES BOOK REVIEW and the Week in Review section of the TIMES. With public support for labor unions at its lowest point in 70 years, Bill Moyers talks with experts Bill Fletcher, co-author of SOLIDARITY DIVIDED: THE CRISIS IN ORGANIZED LABOR AND A NEW PATH TOWARD SOCIAL JUSTICE and Michael Zweig, director of the Center for the Study of Working Class Life at SUNY Stony Brook, about the state of organized labor. Explore some of the crucial issues facing America's workers and priorities for reform. Topics include challenges faced by younger workers, workplace rules, The Employee Free Choice Act, the living wage movement and more.